FANet has posted pics of the two palettes from the Shu Uemura Abracadabra Fantasy collection that will be released on 1 November in Japan. Featuring cover illustrations by Japanese artist Takano Aya, each will retail for 7140yen. The colour combinations look quite lovely but in my experience, the cream bases and liner shades are usually quite mediocre, but still Shu Uemura keeps putting them in these palettes. The names are quite unusual in Japanese, so I'm not too sure how they will be translated into English. The palette on the right is called "Wanwan! Magic Queen Palette". Hmmmm don't look too interesting to me! 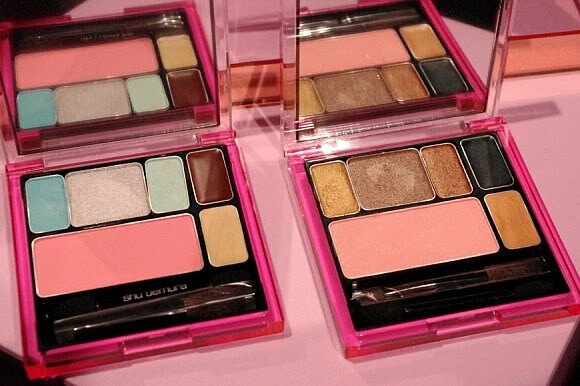 Shu Uemura has been releasing eyeshadow palettes that are quite boring... I would not get it just for the packaging! Ooh How interesting. 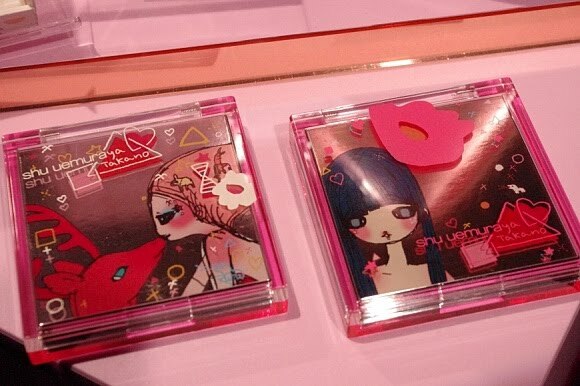 I like all these cute collaborations Shu Uemura has been doing lately! No, I don't do paid reviews. OOh.. the packaging look so cute! While I think that the packaging looks really cute and interesting, the palettes themselves don't interest me. Honestly though, the only thing that I've tried and currently use from Shu Uemura is the eyelash curler. I haven't ever tried anything else.